So, apparently, my fantasy basketball novice self didn’t realize that last week’s matchup would carry over into this week on account of the All-Star break. Thus, I prematurely declared a 5-3 victory for my Derrick Rosie O’Donnells over Adam Fromal’s Aggressive Layups. 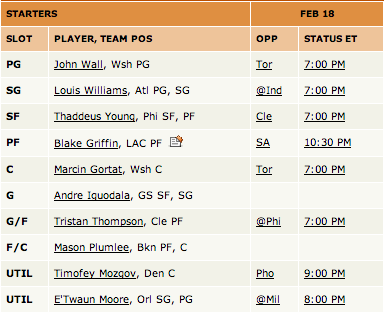 Please, basketball gods, don’t punish me for my ignorance and/or my hubris on this occasion. I promise I’ll do better! I SWEAR!!! Looks like Adam and I are even on the “simple math,” though Alonzo Gee’s presence in my lineup and Devin Harris’ day-to-day status could crimp my D-RODs’ style in a big way. I’m pleased to have at least one of my heavy hitters (Goran Dragic) in the mix, but even he can’t offset the likely contributions from All-Stars Blake Griffin and John Wall for the Aggressive Layups. 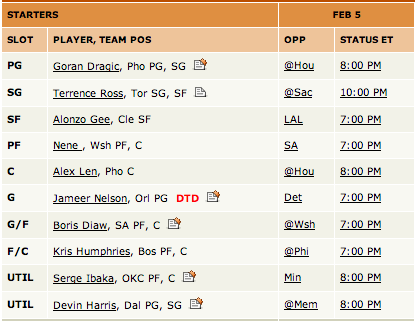 I’ll have to keep my fingers crossed, then, that Nene, Jameer Nelson and Terrence Ross come through in a big way. Otherwise, my jumping off the gun could prove doubly embarrassing for me and plenty profitable for Adam. But, at least my “principles” are still intact. As of today, my “No Transactions!” streak is going strong at 75 days! That’s some consolation…right? This entry was posted in Uncategorized and tagged Fantasy basketball, Fantasy Sports, NBA on February 18, 2014 by Josh Martin. I hope you guys are enjoying the NBA’s All-Star festivities in New Orleans so far. I, for one, have trouble finding the time and energy to care about glorified pick-up games like the Celebrity Game, the Rising Stars Challenge and, well, the All-Star Game itself, though the Three-Point Shootout and the Slam Dunk Contest should be fun. …interesting because MY D-RODs WON! WE WON! WOOOOOOOOT!! For those of you keeping score at home, that means I’ve come out on the right side of the ledger for three weeks running. Not bad for a squad that, by and large, was auto-drafted. I’d say I can’t wait to see what happens next week, when my D-RODs take on Team Foster, but I’d be lying. The fact is, I’m much more excited for the Daryl Morey fever dream that is All-Star Saturday than I am for another fit of fantasy basketball. And, frankly, so should all of you. This entry was posted in Uncategorized and tagged All Star, Fantasy basketball, Fantasy Sports, NBA, NBA All Star on February 15, 2014 by Josh Martin. What a difference a day makes. Yesterday, I was freakin’ out about getting smacked around by Adam Fromal’s Aggressive Layups. Today, my Derrick Rosie O’Donnells own a 7-1 advantage, with the Layups hanging on by the thread of a tie in steals. Big ups to Goran Dragic and Nene, whose tricky fingers combined for seven steals in addition to their double-digit scoring efforts. The biggest “thanks” of all, though, belongs to Joakim Noah, who stuffed the stat sheet with a triple-double (19 points, 16 rebounds, 11 assists) in addition to his three blocks. It’s pretty much now-or-never for both of our teams. Tonight will feature the last full slate of games (13 in all) before the NBA’s annual All-Star break. Thursday’s TNT double-header could affect things on the margins, though I certainly toss all my eggs into that rather tiny basket. Then again, it probably wouldn’t be the worst idea for me to hold out some hope for a savior or two on Thursday. My D-RODs are at a simple math advantage and only figure to slip further when factoring in the non-entity otherwise known as Alonzo Gee. On the flip side, Fromal has a full complement of players at his disposal, including All-Stars Blake Griffin and John Wall. 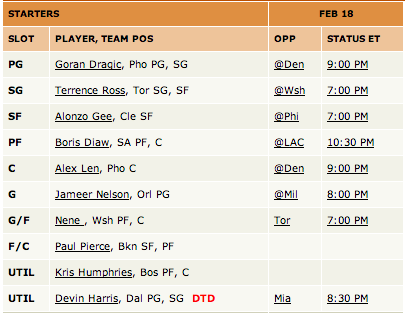 If my D-RODs are to hold the fort tonight, they’ll need big games from some surprising sources—I’m looking at you, Jameer Nelson/Boris Diaw/Terrence Ross/Paul Pierce—to keep the numbers steady and put me on track for a short-but-sweet week. P.S. For those of you whose minds are properly located in the proverbial gutter, today marks Day No. 69 of my current “No Transactions!” streak. You’re welcome. This entry was posted in Uncategorized and tagged Fantasy basketball, Fantasy Sports, Joakim Noah, NBA on February 12, 2014 by Josh Martin. Well, would ya look at that? My matchup with (perhaps) the only other owner in Bleacher Report’s fantasy league who’s more apathetic than myself yielded a 7-1 for my D-RODs. Had I not forgotten to slot Nene into my lineup on Friday, I probably would’ve had my first clean sweep of the 2013-14 season. Not that you’ll find me complaining. This last matchup not only extended my non-losing streak to four weeks, but also secured me my first back-to-back winning weeks of my measly fantasy basketball career—both at 7-1, no less!!! WOOOOOOOOOOO!!!!! Thanks to that, I’ve moved into a virtual tie for 14th place in the B/R fantasy league. Until this week, anyway. I’m now up against B/R National NBA Featured Columnist Adam Fromal, whose aggressive layups have him in first place in the North division. He’s got himself a solid group of productive players—from Blake Griffin and John Wall to Thaddeus Young, Andre Iguodala and Marcin Gortat—that blows the doors off my team’s core. The bad news: we’re down 6-2 right off the bat. The good news: it’s only been one day, so we’re not that far behind. 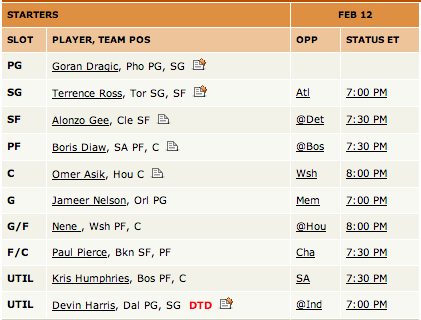 Coming up empty on steals and nearly empty on free throws (1-of-2 from Omer Asik) didn’t help my cause. Neither did my overall lack of impact performances from a relatively barebones lineup. The initial “simple math” goes to yours truly, but with Alonzo Gee and Alex Len counted among my seven-man squad, I might as well be even at five players apiece with Adam’s Layups. If Goran Dragic and Joakim Noah can neutralize the contributions of John Wall and Marcin Gortat, respectively, my D-RODs should be able to make up some ground on the scoreboard by evening’s end. Even more so if Dragic and Devin Harris can rack up the steals, assists and free throws I need to make a run at one of the B/R league’s best. This entry was posted in Uncategorized and tagged Fantasy basketball, Fantasy Sports, NBA on February 11, 2014 by Josh Martin. If I lose to Grant Hughes this week, I’ll have only myself to blame. For whatever reason, I neglected to check my lineup in time on Friday to make sure that Nene wasn’t left sitting on my bench. Had I checked earlier, I’d be ahead in points and steals and might own an advantage in field goal percentage, in addition to my edges in rebounds, assists, blocks and free throw percentage. 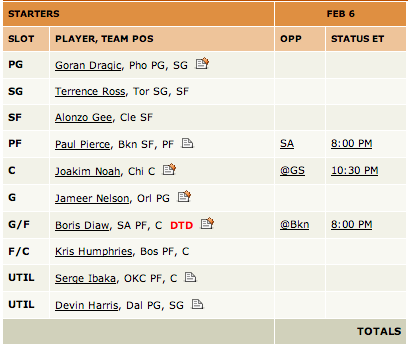 That being said, Grant didn’t exactly update his lineup in a timely manner, either. He allowed Gerald Wallace and Al-Farouq Aminu to languish on his bench, as well. 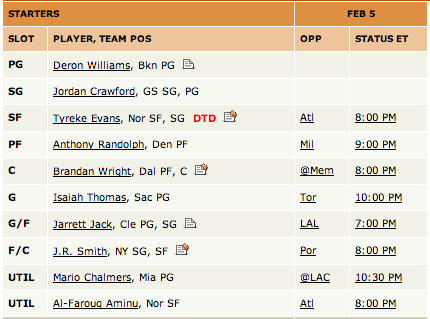 So, really, if we’d both cared enough to update our lineups in a timely manner, we’d probably be tied 4-4 anyway. I s’pose I can’t really be upset, then. Team Hughes gets the “simple math” advantage, but I like my D-RODs’ odds of coming out ahead once the NBA’s seven-game slate is done on Saturday. Even if Alex Len doesn’t play for the Phoenix Suns, Goran Dragic and a healthy Boris Diaw should produce enough between them to at least keep pace with Grant’s not-so-fearsome foursome of Mario Chalmers, Marreese Speights, Jordan Crawford and Anthony Randolph. Still, I wouldn’t go so far as to proclaim my D-RODs the favorites on this occasion. 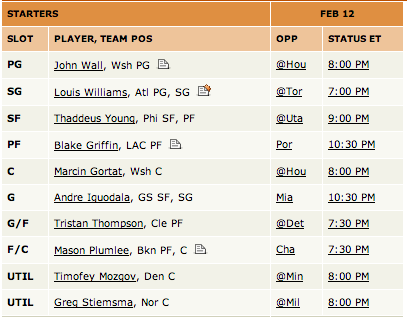 I don’t necessarily believe in jinxes or anything; I’d just rather not tempt the basketball gods if I can help it. This entry was posted in Uncategorized and tagged Fantasy basketball, Fantasy Sports, NBA on February 8, 2014 by Josh Martin. The tug-of-war between Team Hughes and the Derrick Rosie O’Donnells continued apace on Wednesday night. My D-RODs extended their lead in rebounds and pulled even in assists, thanks to a combined 19 helpers between Goran Dragic and Jameer Nelson. 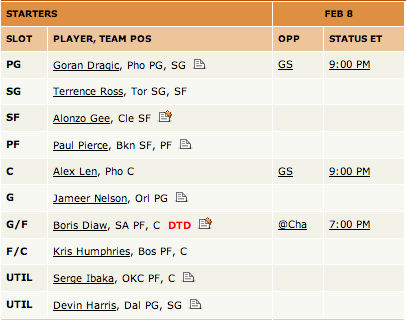 But poor shooting nights from everyone, save for Serge Ibaka, cost my squad dearly in points and field goal percentage. So, too, did a big game from Isaiah Thomas, who scored 23 points and converted 15-of-16 free throw attempts in support of Team Hughes. At the moment, my D-RODs have the simple math in their favor, 3-1. Better yet, two of those three (Paul Pierce and Joakim Noah) have been core contributors all season, and could go a long way toward turning the tables more firmly in my favor tonight. Grant, though, could very easily mitigate my numbers advantage were he to log into his account between now and the end of the evening. He’s got Jordan Crawford and Marreese Speights languishing on his bench, and though those two can’t be counted on to produce much, they surely help Team Hughes offset whatever deficits they’d otherwise encounter. 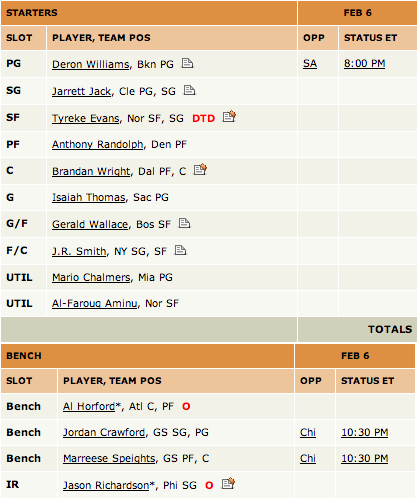 But hey, I’ve already done my part to alert Grant to the very existence of his fantasy squad. Now it’s on him to tend his own garden while I half-heartedly hoe my own. This entry was posted in Uncategorized and tagged Fantasy basketball, Fantasy Sports, NBA on February 7, 2014 by Josh Martin. Before we get started, it’s come to my attention that my opponent for the week, Grant Hughes, is infinitely lazier than I am when it comes to this whole fantasy basketball thing. 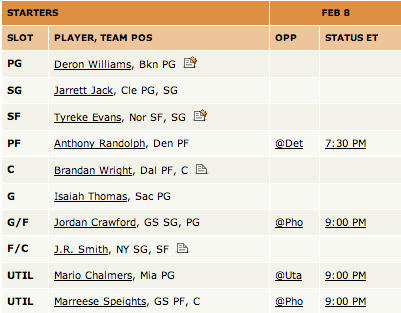 @JoshMartinNBA I'll see your lazy man-ness and raise you this: I just remembered I have a fantasy team. To that end, my D-RODs still have some work to do. They’re still tied with Team Hughes, 4-4, after swapping leads in points and free throw percentage on Tuesday night. I’d be more upset at Goran Dragic for missing half of his freebies if not for the fact that his 24 points practically put my squad ahead in that category. It helped, too, that Team Hughes had but a single bucket from Jordan Crawford to account for its scoring. Crawford’s four assists were enough to extend Hughes’ advantage in that category, just as the 21 rebounds between Dragic and Joakim Noah put me well ahead on the boards. The simple math has me out ahead for the evening, 10-8, though the inclusion of Alonzo Gee and Alex Len therein could pare that down a bit. Jameer Nelson’s return from a sore knee should help my D-RODs creep up in assists and, perhaps, gain some ground in three-pointers. And if everyone else does a better job of converting their field goals and free throws, my D-RODs should be well on their way to another winning week. This entry was posted in Uncategorized and tagged Fantasy basketball, Fantasy Sports, Goran Dragić, Joakim Noah, NBA on February 5, 2014 by Josh Martin.